Apple on Wednesday began offering Apple Music and other digital content in China, putting a bargain price on the service in the high-priority market. Along with the streaming music service, Apple opened the online doors of iTunes Movies and iBooks to customers in China. "Customers in China love the App Store and have made it our largest market in the world for app downloads," Apple senior vice president Eddy Cue said in a statement. "One of the top requests has been more great content and we're thrilled to bring music, movies and books to China, curated by a local team of experts." Apple Music in China features local artists such as Eason Chan, Li Ronghao, and JJ Lin, along with international performers including Taylor Swift and Ed Sheeran. 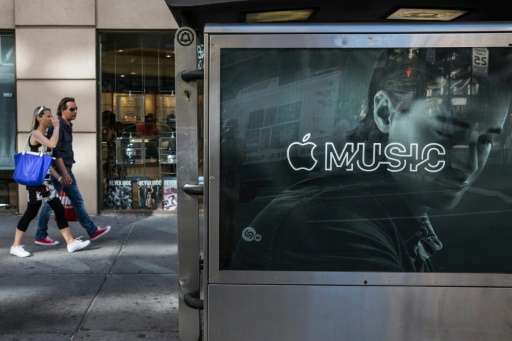 Apple Music, which launched in more than 100 countries at the end of June, was offered in China for a monthly subscription price of 10 yuan (about $1.60), with a family plan available for 15 yuan (about $2.40) per month. Apple, whose iTunes revolutionized how disparate parts of the world buy music, designed its streaming music service with an eye to being the first truly global radio station. The California-based technology titan made its move on the back of a trend of people shifting to streaming music, which allows on-demand unlimited content online. Apple Service began with the launch of Beats 1, an international radio station that will feature shows by high-profile artists. Movies on iTunes will be available at a starting price of five yuan for a high-definition rental and 18 yuan to buy a new release. A selection of paid and free digital books in Chinese were on the shelves of the iBooks Store, according to Apple. The iBooks Store offers customers a wide selection of both paid and free Chinese language books from top local publishers, including "Big Head Son & Little Head Dad" by Zheng Chunhua and "The Family Belongings of Chinese People" by Ma Hongjie. "For the first time, customers in China will have access to Apple's entertainment ecosystem with music, movies and books right at their fingertips," Apple said.